The root for this model was my idea to use the plastic sprue from the 2018 Harry Potter wand element as an anchor. One thing led to another, and before you knew it I had a miniature 19th-century frigate on my hands! I built and refined my boat design over about a week. Meanwhile producing these photos, with their complex backdrops and lighting effects, took a bit longer than that… especially once I realized I wanted the photo you see above, where I’ve spliced both color variants together on one canvas for a “War of 1812” battle situation; that was a doozy to make! The trickiest part of this build, and the part of which I’m proudest, was capturing the subtle curvatures—the simultaneous bowing down and swelling out around the middle—of a ship’s hull using rectilinear bricks. The solution came in the form of slight offsets, increments provided by miscellaneous SNOT bricks and brackets. By including a (historically accurate) painted stripe along port and starboard sides, the curvature I engineered gets a nice accentuation. An unexpected consequence of the ship’s curved structure, where no two pieces of the hull are quite aligned with each other in width or height, is that the ship comes together in several different “slices” anchored on a spine at their base. The resultant modular design makes the ship quite easy to build, a fact that led me to producing a set of instructions for the build. The masts slide right into this same bottom frame, granting the ship extra stability. Speaking of the sails, these were a very late addition, as it took me a while to decide that the studded texture looked okay! A British frigate with 18 guns, the HMS Manchester proudly serves King and Empire! This color variant of my frigate design has a “golden” stripe along its sides, characteristic of Imperial ships of the time. 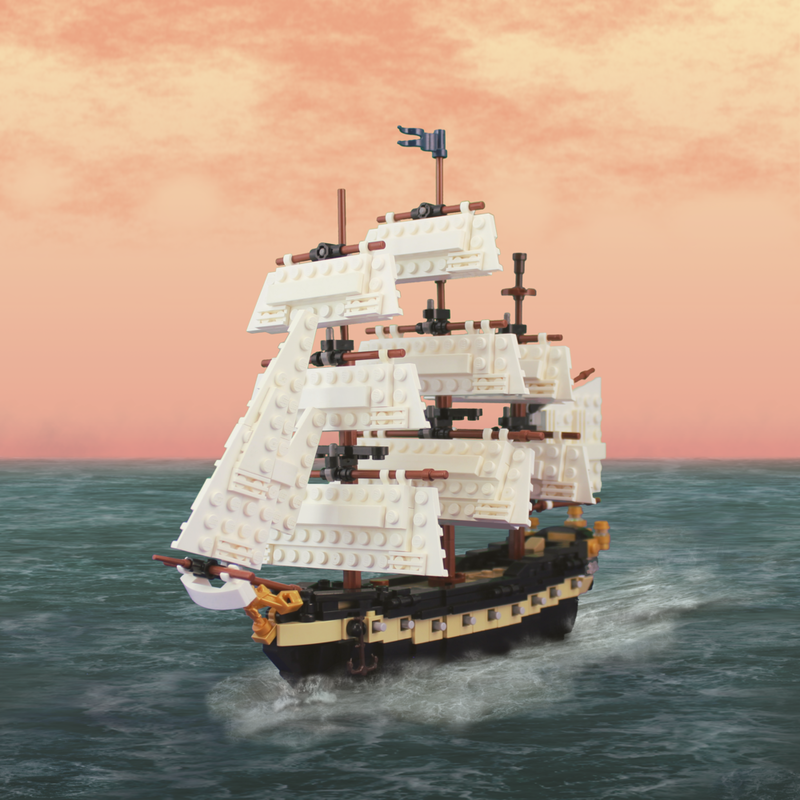 I could have gone for a purer yellow, which would have been perhaps more accurate—see the HMS Victory, a preserved British ship from the Napoleonic wars—but didn’t have enough headlight bricks in yellow to make that happen. The golden figurehead and lanterns felt like an appropriately royal touch, as did the navy blue flag. I’ve named this boat the Manchester to signify it as my first design in my new home in Manchester, NH. This American vessel, the USS Declaration, sports a full array of 11 sails, and can travel at speeds of up to 18 knots! I opted for a classic white and black coloration here, inspired largely by my visit to the USS Constitution while researching for this build. 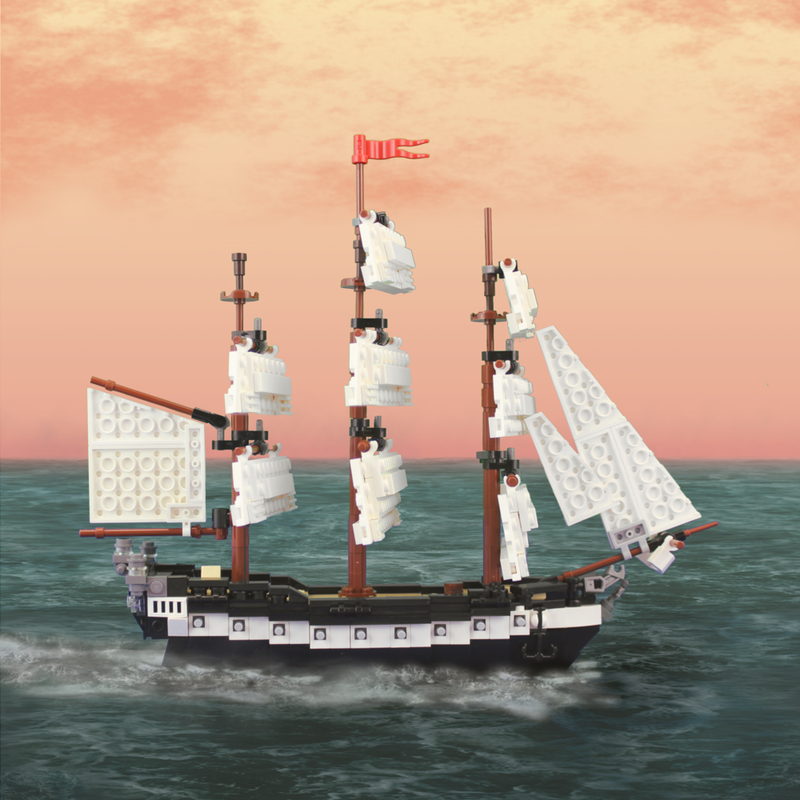 As you can probably tell, the name of this LEGO frigate, Declaration, pays homage to the famous “Old Ironsides” as well. Steel-grey figureheads and a red pennant make for a dynamic, modern finish. I’ve also moderately altered the side windows on the cabin to differentiate the Declaration just a tiny bit from the Manchester.